Vodafone Group Plc (VOD) provides mobile telecommunication services worldwide. It offers mobile voice services to approximately 447 million customers; messaging services; mobile data services; fixed broadband services; and whole sale carrier services. This international dividend achiever has consistently raised dividends every year since dividends were paid in 1989. The company’s last dividend increase was in November 2012 when the Board of Directors approved a 7.20% increase in the first interim dividend to 3.27 pence /share. This is equivalent to 52 cents/share. The company’s peer group includes China Mobile (CHL), America Movil (AMX) and Verizon (VZ). Over the past decade this dividend growth stock has delivered an annualized total return of 8% to its US shareholders. 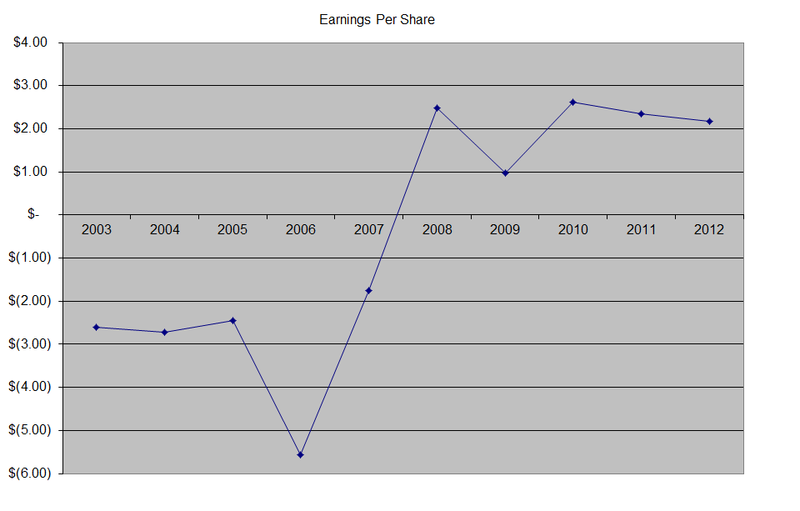 Earnings per share increased from a deficit of $2.61/share in 2003 to $2.18/share by 2012. Analysts expect Vodafone to earn $2.53 per share in 2013 and $2.57 per share in 2014. Over the next five years, analysts expect EPS to rise by 6.20%/annum. Each ADS is equivalent to ten ordinary shares traded on London Stock Exchange. The company has managed to boost dividends every year since 1989. In addition, it also distributed an extra dividend payment of 62 cents/share in connection with its receipt of dividend from Verizon Wireless. Vodafone pays dividends twice per year. The first payment which occurs in February is the interim dividend, which has accounted for approximately 40% of total annual dividends for the year. Final dividends are typically paid in August. Since the dividend is paid in US dollars to ADS holders, it is not stable like the dividend paid in British Pounds due to fluctuating currency exchange rates. 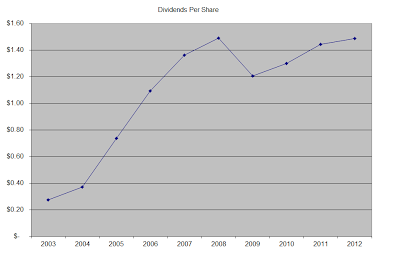 Since 2002, the annual dividend in British Pounds has increased from 1.47 pence/share to 9.52 pence/share in 2012. The dividend in US dollars increased from 21.6 cents/share in 2002 to $1.48/share in 2012 (excluding the special distributions paid). Unlike other countries, the UK does not withhold any taxes out of US stockholders distributions. Currently Vodafone is attractively valued at 10.20 times forward 2013 earnings and yields 5.70%. The forward dividend payout ratio is around 60%, which is sustainable. The company looks like a much better telecom play in comparison to AT&T (T) and Verizon (VZ). Given that I have zero exposure to the telecom sector, I recently initiated a position in the stock.